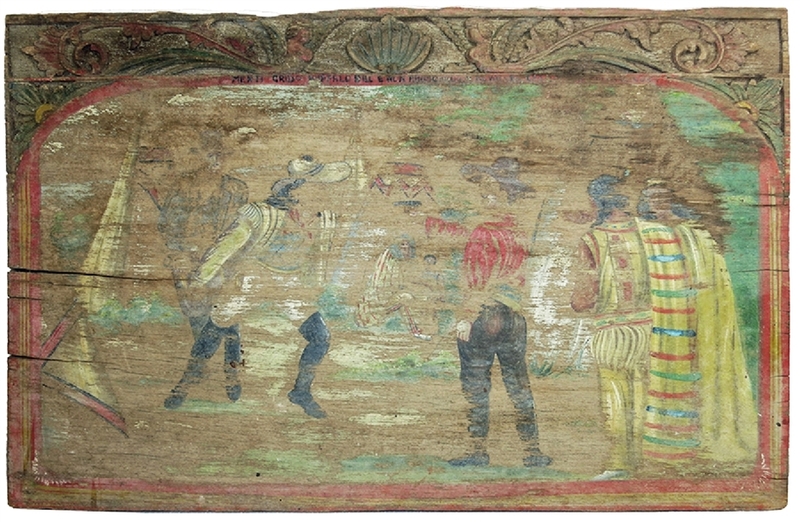 Hand-painted wooden panel, 21” x 13.75” x 0.75”, from one of the wagons used in Buffalo Bill’s Wild West Show, circa 1884-1890. Devised as an advertising vehicle to draw people to his shows as he travelled from town to town. A detailed color scene depicting teepees in an Indian village and men dressed in western garb. Slight fading, could be artfully restored. ...,plu, Accompanied by the actual photocard which accompanied the tickets purchased for Buffalo Bill’s 1916 season. It turned out to be his last. Buffalo Bill and Miller Bros. & Arlington 101 Ranch Real Wild West combined to perform for just that one season. On cardstock, 3.75” x 5.75”, it pictures Col. Cody and his facsimile double signature “W.F. Cody / ‘Buffalo Bill.” The verso is blank. The original 6” x 4” ticket envelope is present. A thin gray stripe along the envelope’s left edge indicated in which section the ticket holder would sit.